We've already looked at how to turn off location services in the Windows 10 Creators Update. But the operating system isn't the only way your location gets used. 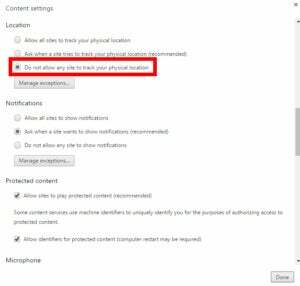 Your browser can also serve up your location, though by default most browsers ask your permission before doing so. 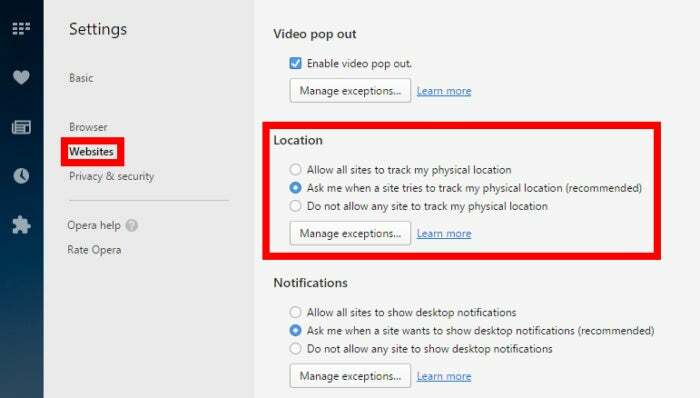 If you don't wish to get those requests, here's how to turn off location requests in the major browsers on Windows. Let's start with the easy one. 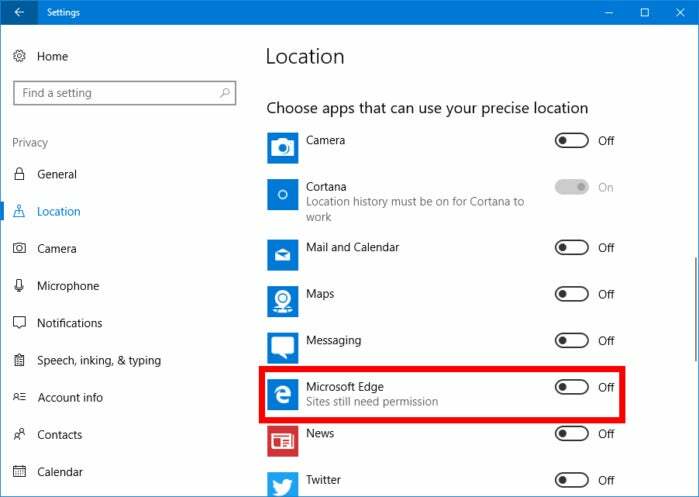 Because Edge is built on the Windows Store platform, stopping it from asking for your location is simple. Open the Settings app and go to Privacy > Location. Scroll down to the bottom of the screen until you see the heading "Choose apps that can use your precise location." Now just turn the slider next to Microsoft Edge to Off. In Google Chrome, click the menu icon (three vertical dots) to the right of the address bar. From the drop-down menu select Settings and the settings tab will open. At the bottom of this tab click Show advanced settings. Under "Privacy" click Content settings to open a pop-up window. Scroll down in that window to the "Location" section and click the radio button labeled Do not allow any site to track your physical location. Now click Done. That's it. Opera uses the same basic core as Chrome, so the setting is similar. Click Menu in the upper-left corner. From the drop-down menu select Settings. In the tab that opens select Websites from the left-hand navigation column. Under Location, click the radio button labeled Do not allow any site to track my physical location. Mozilla's location settings are handled by a flag in its hidden configuration menu. Type about:config into the address bar and hit Enter. You'll see the usual "This might void your warranty!" warning. Just click I accept the risk and move on. Now in the search box type geo.enabled and hit Enter again. The Geo Enabled option should be the only one that shows up. Double-click that option with your mouse to disable it. You'll know if it's disabled if it says false under the heading Value. 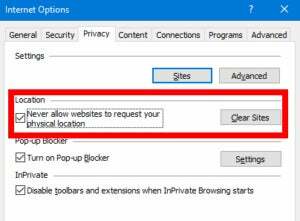 If you're still using Internet Explorer, you can restrict location requests here, too. This tutorial is based on Internet Explorer 11. Start by clicking the cog-shaped settings icon in the upper-right corner. From the drop down menu select Internet options. In the pop-up window that appears select the Privacy tab, and check the box under Location labeled Never allow websites to request your physical location. Now click Apply and OK, and you're done. That covers how to turn off location requests in the major browsers on Windows.